Adding social media to your website is a necessity and can be done in many ways. 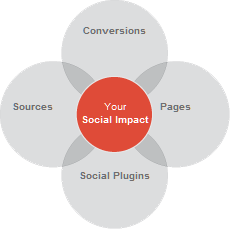 The most popular social media marketing forms are the Social Sharing and Following features. Social Media Sharing can extend to any type of pages, whether you intend to give visitors the ability to share a blog post, a product on your eCommerce store, or simply the website or business itself. Social Following, also known as Social Subscriptions, gives the ability for users to subscribe to your website via Facebook, Twitter and Google Plus Pages. This can be displayed with a simple follow button or larger widgets, such as Facebook or Twitter activity feeds and other methods. Know what content has been shared and how often it has been shared, via the 'Like', 'Tweet' or 'Plus One' button. Find out how many people have seen the shared content on the social network pages it has been shared on. Track how many people have taken action, such as clicking the link back to your shared content, or reshared, 'Like', 'Retweet' or '+1' content from someone elses share. Lastly, determine what social traffic sources convert to conversions on your website, or simply determine what general traffic sources, such as search, email or referral traffic, convert into social actions. Take the next step in Social Media Marketing with the advanced social API technologies from Facebook, Twitter and Google Plus. Going beyond the Facebook Fan Page. Integrate Facebook with your website in many ways. Allow users to comment with Facebook, sign-in with Facebook and much more. Have Twitter conversations on your Site. Use the Twitter API to display stories, tweets about you or your tweets right on your website as well as Twitter login and user integration. We offer mobile development services for enterprise business such as mobile SEO, mobile app development or simply mobile websites and e-commerce. If you are unsure about your Social Media Marketing strategies and don't know what next steps to take, we recommend getting professional Social Media Consulting. Learn more about Social Media Marketing on our internet marketing blog.